Bird's RF terminations are world renowned for their high-quailty, robust construction and conservative power ratings. 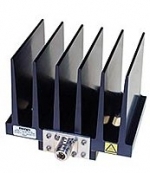 The use of non-magnetic materials and plating provide safety when used in high magnetic fields such as MRI. Frequency Range and VSWR: DC to 1 GHz at 1.10:1 max, 1 GHz to 2.4 GHz at 1.25:1 max.